Spain in general and Catalonia in particular has an immense amount of rock. There is limestone, granite, sandstone, conglomerate and volcanic rock. There is world class bouldering, 1000 meter routes, deep water soloing and the best sport climbing in the world. There are 300 days a year of sunshine. In short: there is a reason why the best climbers in the world move to Spain or spend a good part of every winter here. For the vast majority of these areas there exists no or little information in English. All the guidebooks are in Spanish and the climbing web sites and blogs are in Spanish or Catalan. Very little of the information about hotels, camping and houses to rent close to climbing is available in English. To even be able to buy the guidebooks is hard, many times they are only sold at the local climbing shop or through a web site with all the information in Spanish. The areas that have English guidebooks or information get a majority of the tourists, who knows how the Siurana-area would look without the RockFax-guide to climbing in Costa Daurada? The goal for us here at Climb in Spain is simple: We want to make it easier for you to Climb in Spain. A general presentation of all the major climbing areas. Travel information, maps, links to on-line guides and existing guidebooks. Several options for lodging, camping, refugios and houses for each major climbing area, including the possibility to book directly from our web page. In our store you will be able to buy the guidebooks for the major climbing areas. We will only sell books that give back to developers of the climbing. We will have the latest access information. We will present hidden gems that previously have not been available to non-Spanish speakers. 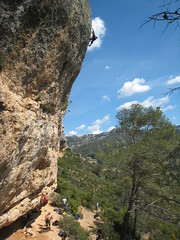 How about sandstone sport climbing just north of Barcelona? Deep Water Solo in Costa Brava? Long lime stone routes in the heart of Catalonia? We have it all! We will high light good sectors of well known climbing areas that we think deserve more attention. Climbing trips for beginners, singles, groups or simply if you’re short of time. Transportation, lodging and an English speaking local climber that will take you to the best climbing for your level – all that is included in these amazing trips! Looking for more advanced experiences? Through us you can find a skilled mountain guide that can take you to the adventure of your life! Never forget that we are here for you, if you have any question at all about climbing here you can rest assure that we can help you. Never hesitate to contact us!